Roy McCarthy had been racing MG's since 1970 and is well known among the Club Racing fraternity. Originally most club drivers raced using their name as 'Sponsor' and it was not until 1995 with the addition of his two Sons that the title McCarthy Motorsport came about. Sponsors were mostly for people who had to pay others to build them a car or an engine but Roy was capable of both, having built up an Accident Repair Bodyshop he had the capabilities of building his own cars. Roy was also a Mechanical Engineer starting his working life in the drawing offices of an Engineering company from which evolved his interest in all things mechanical, his passion being to make the best of an engine and find all the best ways to improve on its design. This he had managed to do over the years and was in demand for providing race engines that were fast and reliable. I have been racing since 1971 after purchasing a derelict MGA from a barn with mice in the seats and chickens nesting in the boot for £30 and rebuilding it and choosing the bright colour yellow (Porsche Saturn yellow) as my racing colour, most MGA’s seemed to be red. I have run an accident repair body shop for most of my working life and have used the facilities to help me in my preparation work. I have also repaired and prepared many race cars during this 30 odd year span. I was an engineer before venturing into the Accident Repair industry and I also develop and build the engines and suspension myself. I raced an MGA, off and on from 1971 to 2000 and won the MGCC MGA Championship 6 times outright and in between had a go for a couple of years in an Austin Healey which I found very heavy and was not as supple as the MGA. About 1981 ish I also raced a delightful Chevron B8 with a BMW engine mostly in the John Foulston’s Atlantic Computer Leasing Championship with some success but found its preparation and the Continental circuits too time consuming for my business. The Chevron took me into places I had never been before attending as support races at F1 GP’s at Silverstone and Brands Hatch. In April 1985 I returned to the MGA and in March at Brands I had a coming together with the barrier at Paddock Hill and managed to break my neck, the neck condition not found until five days later when I went back to the Hospital for a check up and they put me straight into traction for seven weeks. Luckily no permanent damage but it was the second and third vertebrae in the neck so I could have ended up totally disabled had it not been picked up when it was. I had the rest of the Season off and came back out again in 1986 in the MGA and won the MGA Championship. 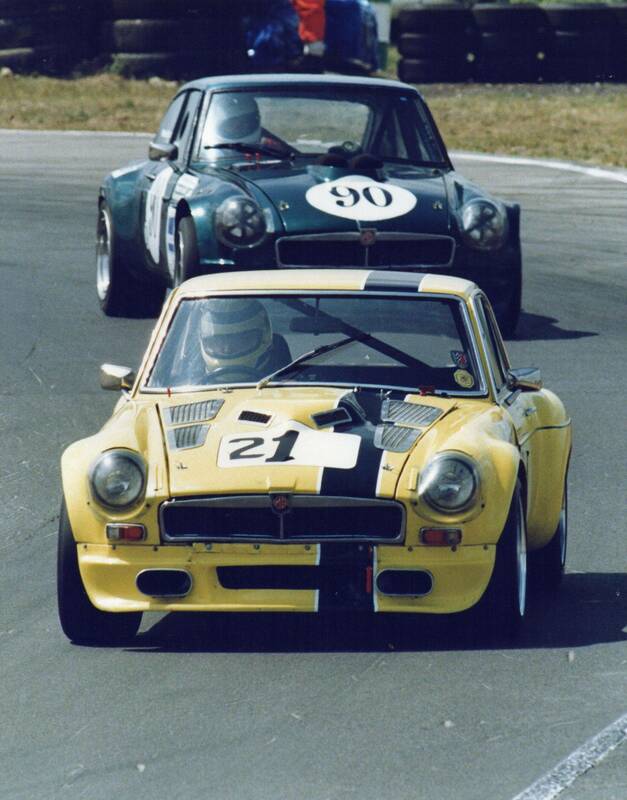 1990/91 I raced a Standard MGB GT V8 in the BCV8 B class winning the Highest Placed Standard V8 Award. 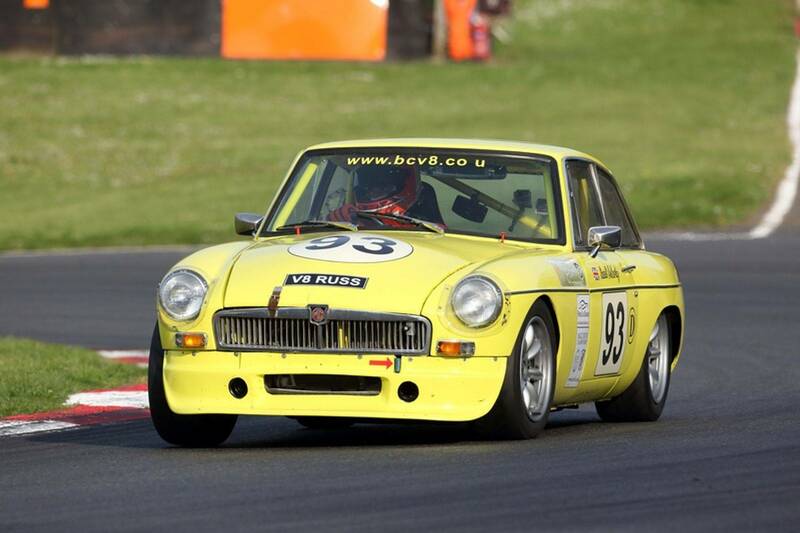 Then in 1992 I swapped the Standard V8 for Richard Horn's Fully Modified MGB GT V8 again for the BCV8 Championship, did a few mods to the engine like adding a flat plane crank quite a challenge at the time. I had a couple of Seasons in the D class with the 11” slicks trying to sort it out and after a few more mods it worked successfully and is still in the car. In 1997 I raced the V8 again in the BCV8 Championship and after a difficult year medically, after being diagnosed with Non Hodgkinsons Lymphomas I raced intermittently between the chemo to keep my mind channeled and battled on and came third in class D. In Feb 1998 I was told I was in remission and my life continued again with a sound bill of health. I again started racing the V8 in 1998 but the season came to an abrupt end when a crash at Mallory put the V8 on the back burner so I brought the MGA out again and raced it till the end of the Season. I entered the Flemings Thoroughbreds in the MGA (which is a B class car with a 1950cc engine) in the D class and had great fun battling against the Astons. I also had a couple of two drivers with Graham Ball in his Aston DB4. 2001 Raced the MGB Roadster in the BCV8 and Moss Thoroughbred Championships - came in 5th in the BCV8 B class behind both my Sons - seem to be loosing it to young blood. I did manage to win the Thoroughbred Overall and B class on the result of the last race of the season at Cadwell Park. 2002 went back to the MGBGT V8 and decided to convert it back to a more uniform spec so got rid of the 11” slicks, big wings and the lumps on the bonnet and put her on 6” road rubber so she could enter other races than BCV8. She was now compatible with the Thoroughbred Championship’s D class and so I could officially race with the Astons, Morgan’s, TVR’s of a similar engine size. This opened her up to more Championships as in her big spec on the slicks she could only race in the BCV8. Another fantastic Thruxton memory from late in the Season was a race at an AMOC meeting where I managed to stay in front of my hero Gerry Marshall to win the Thoroughbred race. That’s where I have been since 2002, mostly with the Thoroughbreds but also now with the Heritage Series where I am the little V8 among the big V8’s. Another memorable race at Brands in September 2004 when again in a BCV8 Championship race I led the field with Spencer not too far behind and Russell acting as tail gunner between us and the rest of the field. Again a podium for 1st, 2nd and 3rd for McCarthy Motorsport. I’ve raced in Zolder, Spa, Kirkestown, and probably all the circuits in England. Pam my Wife has been with me all the time and only missed a few meetings since we were married in 1970 . Another couple of years of bad health in 2008 and 2009, the Non Hodgkinsons Lymphomas came back and first my spleen came out and then they put me back on chemo. By September 2009 I was told I was fully fit again and I got ready for a new season in 2010. By April 2010 I was feeling unwell again and a trip to the Hospital showed that the N.H.L. had transformed into a Lymphoma which had set up residence in my right hip, straight back on chemo but with reduced odds for a recovery this time. However, after two heavy sessions they said it had shrunk so I kept on racing for the next few months feeling OK. I had a race with the Masters at the reopening of Donington on 4th September 2010 and did quite well, second in class, fourth overall and the week after felt quite ill so went up the hospital. They did some tests and took a scan and after a few days told me that the little bugger had recognised the chemo and changed its format and started to regrow across my stomach at an amazing rate, 'sorry' they said, a hard thing for them to say as I had made many friends at the Hospital in the fourteen years since my first N.H.L. Russell and Spencer who have followed into MG racing are both very good drivers. They deserve to do better but they just enjoy being out on the track with their MG’s as I do. They tried their hand at Ginetta G20 racing in 2007, 2008 and 2009, Spencer was Ginetta G20 Overall Champion in 2008 and Russell was fifth overall in 2008 and 2009, not bad for a couple of MG lads. Most people are surprised at the speed of the MG’s, we compete with most Marques and come off better more often than not, they are flexible and fast and when you get in trouble they are forgiving. The fully modified V8s have been clocked at Spa at 180mph. Never kept a list of the wins and class wins but it must logically be in the region of 400 – 600.